Stepdaughter of the philosopher Willam Godwin and therefore stepsister of Mary Godwin. In 2010 it was discovered that her father was John Lethbridge, Baronet of Sandhill Park in Somerset (1746-1815). Her mother was Mary Jane Clairmont, who married William Godwin in 1801. After a short romance with Lord Byron - whom she first saw as early as 1812 - she gave birth to his daughter Allegra after travelling through Europe in 1816 with Mary Godwin and Mary's future husband Percy Bysshe Shelley. She was also present during the night that Byron and Shelley told ghost stories, inspiring Mary Shelley to write her Frankenstein. Claire agreed that Byron would take care of Allegra because her daughter would have better prospects that way and she surrendered her to him reluctantly. Allegra died in a convent a few few years later and Claire would hate the poet all her life, allthough many young children died in those years and it could hardly be called his fault. After Shelley's death she went to Vienna in October 1822, where her brother Charles was living. She was very poor and became seriously ill, but she recoved enough to go to St. Petersburg to work become - helped by her command of five languages - a paid companion for the daughters of Countess Zotoff in 1823. By the spring of 1824 she was the governess of the children of the lawyer Zachar Nicolaivitch and his wife Marie Ivanovna in Moscow. Unfortunately, their daughter Dunia died in 1825. Claire moved on to another family and on 27 December 1826 in Moscow there was talk about the nobleness of Lord Byron and in her diary she wrote: "Amongst other things he said that this paragon of generosity had pensioned Shelley's widow. Oh my God, the lies there are in the world." In 1828 she left Russia and returned to London, but in 1829 she accepted a job as a governess in Dresden. During the 1930s she lived with Margaret King in Italy and she considered this the happiest time of her life. In 1836 she returned to England again. She worked as a music teacher and she cared for her mother when she was dying in 1841. In the 1840s she lived in Paris, from where she travelled frequently to England. In 1844 she received an inheritance of 12,000 pounds from Shelley's will after Shelley's father had finally died. But soon she lost most of the money in a theatre scheme. In 1870 she settled in Florence, where she lived with her niece Paulina. She eventually became a catholic (she had hated catholicism earlier in life). Claire kept in touch with Mary Shelley (until her death in 1851) and E.J. Trelawny, another member of the Byron and Shelley circle. By the time William Michael Rossetti visited her in Florence in 1873 she had become a strange old lady. Henry James' novella "The Aspern Papers" is based on her later years, when visitors tried to get their hands on her Shelley memorabilia. 13/5/1815 Claire Clairmont leaves Shelley and Mary Godwin for Lynmouth. In Lynmouth, she stayed with a Mrs.Bickwell. It was probably an attempt by mer mother Mary Jane Clairmont to move her away from Shelley and Mary. 22/3/1823 Claire Clairmont leaves Vienna for Moscow. There she was to work as a governess for the two daughters (14 and 16 years old) of Countess Zotoff. 23/9/1825 Clair Clairmont's prot�g�e Dunia dies. Clair Clairmont was the governess of the Russian girl. Dunia fell ill and died soon afterwards. The funeral took place on October 8th. 16/10/1828 Claire Clairmont arrives in London. She had worked for several years in Moscow as a governess and on her way home she had taken a cure in Dresden before she returned to England. 0/0/1836 Claire Clairmont returns to England. She returned to England in the year that William Godwin died. She worked as a music teacher and cared for her mother when she was dying. 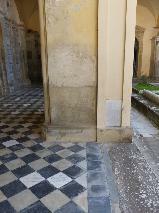 After her mother died in 1841 she moved to Pisa. 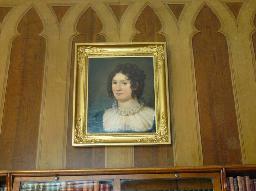 Portrait of Claire Clairmont by Amelia Curran at Newstead Abbey. 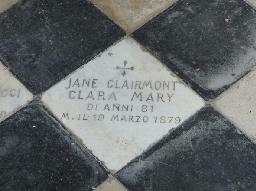 Memorial stone for Claire Clairmont under the arcades of the Cimitero Monumentale della Misericordia di Santa Maria, Antella.